Tai-chi-Chuan is a strange mix of health exercises, meditation and fighting. 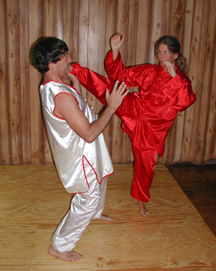 While most people practice Tai-chi strictly for health and exercise, the “Chuan” in the name reminds you that it is a martial art. Yet there is no blocking and the movements are relaxed and fluid. The basic principle of Tai-chi-Chuan is to shadow your opponent. 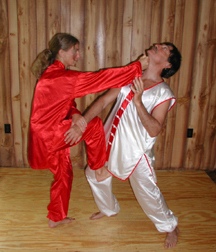 Where he strikes, you move away from his strike but into an unprotected area of his body. Where he moves away, you follow him so that you are like wet clothes he is trying to get off. You exhaust him and undermine his power. You don’t allow him one second to recover from his series of strikes. We train to sustain our attention so that we don’t need that second to evaluate the effect of our actions. We act and perceive at the same time so that at every moment we can change and adapt. If our strike is blocked, the arm just circles around and still comes in. Since the power doesn’t come from the arm, but from the whole body, the strike still has power. We remain calm and centered throughout the sparring due to our training in forms, chi-gung and push hands. This training of sustaining the attention, adapting at every moment, being aware of the effects of our actions as they happen and the ability to remain calm and centered in the midst of being attacked, helps us in our everyday lives. It teaches us that we can’t control the actions of others or the circumstances of the world we live in, but we can control how we react to all that. The principle is that we let the attacker move as he wants to. We don’t interfere with his actions. But we control the relationship between us. If he wants to strike our head, we move our head and go to a spot he is not protecting with our own strike. He does what he wants; we do what we want and we are both happy (except that he gets hit). We become his shadow and our strikes come out from his actions. Which gets me to another subject – Monsanto. This company is copyrighting patents on genetically engineered food and getting the large “factory farms” to use their seeds. Since they own the seeds the farmers are not allowed to keep seeds to replant. They have to buy their seeds from Monsanto every year. The attempt is to copyright organisms and own them. Many people think this is outrageous. If a farmer is using natural seeds and Monsanto pollen enters his fields through the wind, then Monsanto automatically owns the rights to his crops and he can no longer save his seeds to plant. This is why I think that we all need to become farmers. Even if we just plant a few tomatoes or peas in a plant pot we are helping prevent a company from owning life itself. We also are assured of healthy, tasty tomatoes and peas. I see Monsanto’s “ownership” of life as a sort of strike against humanity. They are trying to become God. While we certainly need to fight against that through legislation, simply planting food plants is a way of undermining Monsanto. It is a shadow form of farming that makes them less powerful. Let they try to investigate everyone who has peas growing in a pot in their window to see if it is one of their copyrighted peas. Let them exhaust themselves. Let them fight the shadow farming. Remember to save some peas or tomato seeds for next year. Keep them dry and in a dark place. Use paper envelopes – not plastic bags – to store them. My garden is so prolific that I weed hundreds of tomato plants each year. The tomatoes fall on the ground and the next year they grow like grass. I compost with kitchen waste, grass clippings, dead leaves (not oak!) and ashes from my wood stove. If you have a rabbit or hamsters (or a horse or cow of course), you can use their waste in the compost as well. Let’s all be shadow fighters in the fight for the right to grow our food. It is one of the most fundamental rights of humanity.